Ubuntu 13.04 "Raring Ringtail" has its share of issues, at least for me. One of the most annoying one being the return of overheating bug (in Intel Core i3 hardware) which plagued me during the Ubuntu 11.04 release cycle (if I remember it correctly). In our previous post discussing things to do after installing Ubuntu 13.04, we had mentioned about this and even some ways to tackle it. But that's another story. 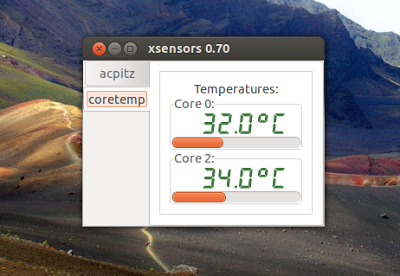 Here we'll discuss about XSensors, a GUI tool to monitor system temperature for Ubuntu 13.04. XSensors is a very basic application that lets you monitor your laptop's hardware health. It can display your system's core temperature, voltage, fanspeed etc. And it is available in Ubuntu Software Center for free. Click the below button to install it from Software Center. Another recommended tool - PowerTop. Simply search for it in Ubuntu Software Center. And if you're new to Ubuntu 13.04 "Raring Ringtail", here are some essentials you need to know about it. Thanks for reading and have a nice day.